The capital of Armenia, Yerevan, is a cozy city famous for its beautiful architecture. The city has a centuries-old history – according to the cuneiform inscription of Urartian King Argishti, it was built in 782 BC, which shows that Yerevan is older than Rome! For those who are in Yerevan for the first time, we recommend visiting its centre known for its unique architecture masterpieces, cozy cafés, restaurants, and beautiful parks. The heart of the capital is formed by the Republic Square, designed by the famous Armenian architect Alexander Tamanyan in 1924. 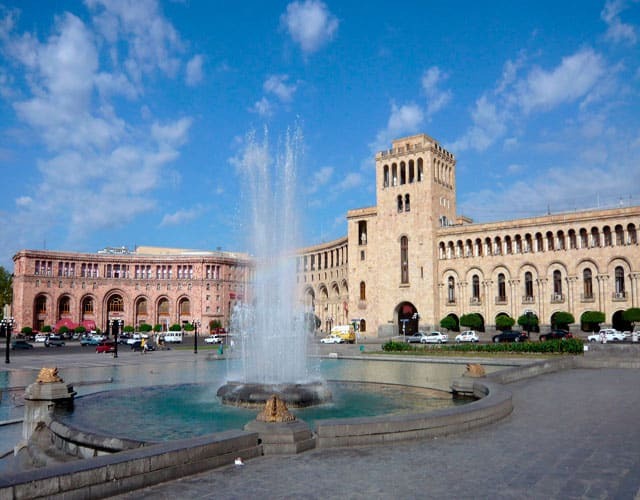 The square is framed by important buildings such as the History Museum of Armenia and the Government House. The stately Republic Square in Yerevan. If you cross the road from the square you will find the Northern Avenue. It is the most modern and high-end part of the capital with its fashionable boutiques and shops, office buildings and luxury hotels. The avenue leads to another must-visit attraction of Yerevan – the Opera and Ballet Theater. It occupies an important place in the cultural life of Armenians and offers an extensive repertoire with its national opera, ballet and excellent symphonic music. 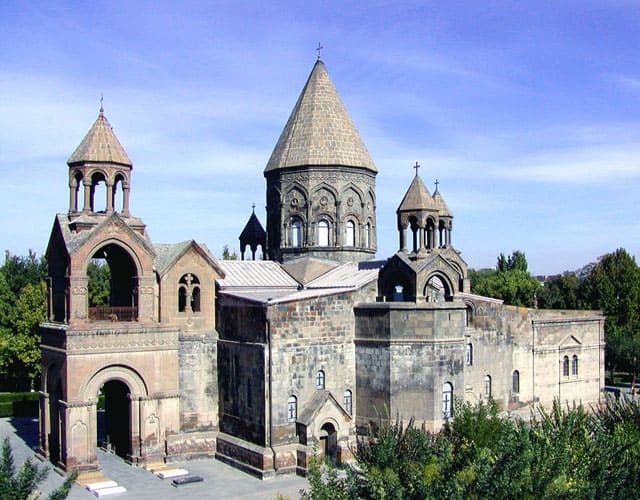 The city of Echmiadzin is located about 20 km from Yerevan (30-minutes by car). A tour of Armenia wouldn’t be complete without a visit to Echmiadzin. Armenia is the first country in the world that adopted Christianity as a state religion (in 301 AD) and the Echmiadzin Cathedral was built to commemorate this. Built on the site of an ancient pagan temple, Echmiadzin is the religious centre of all Armenians. It takes four hours (253 km) to get to the monastery of Tatev from Yerevan by car but it’s really worth the effort! A visit to Tatev is simply unforgettable! The monastery is a majestic medieval (9th century AD) structure located on the edge of a deep gorge and surrounded by amazing mountainous landscapes. In order to get to the monastery, you can take the cable-car (listed in the Guinness Book of Records as being the longest in the world). You will glide over the deep gorge for about 20 minutes and enjoy the fantastic scenery. Sevan (66 kms north-east of Yerevan) is one of the most popular towns in Armenia because of the stunning Lake Sevan. The lake is especially popular in the summer amongst both locals and tourists. 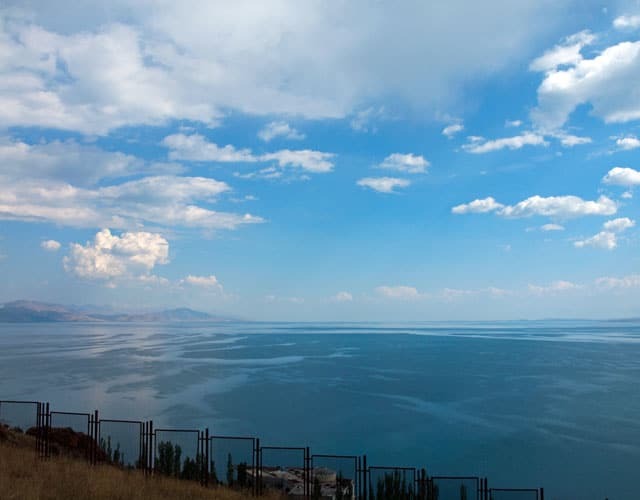 At 1,900m, Lake Sevan is also considered to be one of the highest lakes in the world and sometimes it seems as if the azure waters are about to touch the sky. Its beauty has earned the lake the nickname ‘the pearl of Armenian nature’. While at the lake, you can have a BBQ, cruise on a yacht or catamaran or simply relax and take in the amazing scenery. Sevan is also known for its fish “ishxan” (Armenian trout), so once in Sevan don’t miss the opportunity to order delicious fish dishes at one of the local cafés or restaurants. On the way from Sevan to Yerevan, you can stop to enjoy the view of one of the most beautiful natural sights of Armenia: the Selim Pass. This pass was once the part of the famous Silk Road that linked Europe with the Far East. The ancient caravanserai (a resting place for merchants on the Silk Road) still stands till this day. The view of the verdant valley below is simply breathtaking. Jermuk is one of the most popular spa towns in Armenia because of its healing mineral waters and mild climate. The town has more than 40 thermal springs! 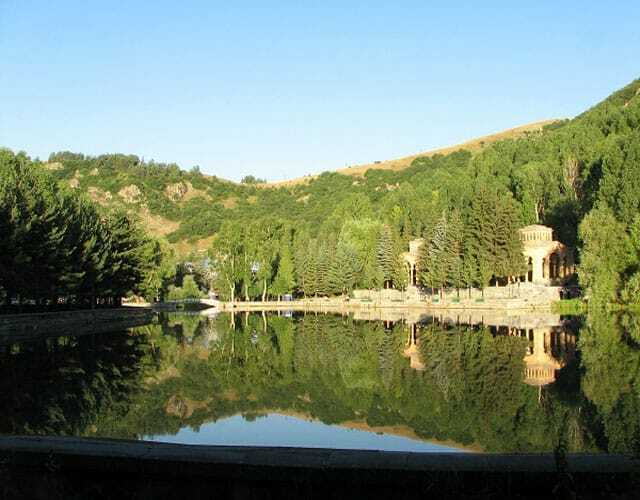 In Jermuk, you can visit the Gallery of Water for free tastings of the healing mineral waters. And don’t forget to visit the most popular attraction – Jermuk Waterfall, which is the second largest waterfall in Armenia. The water tumbles down from the height of about 70m. 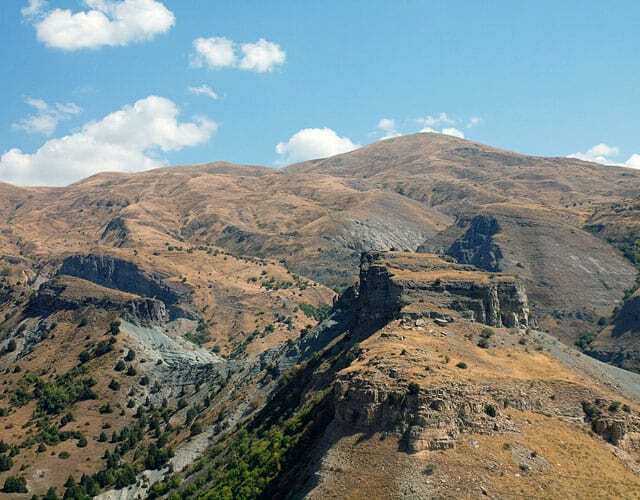 In the Syunik region located about 200km from Yerevan, you’ll find one of the oldest and most popular megalithic sites of Armenia called Karahunj or Zorats Karer (‘army of stones’). It is located on a plateau at an altitude of 1,770m and consists of more than 200 stones each of which has holes 5cm in diameter. This construction remains a mystery for scientists who have different versions concerning its origins and use – the most popular version states that the construction dates back to the 6th century BC and served as an observatory for star-watching. 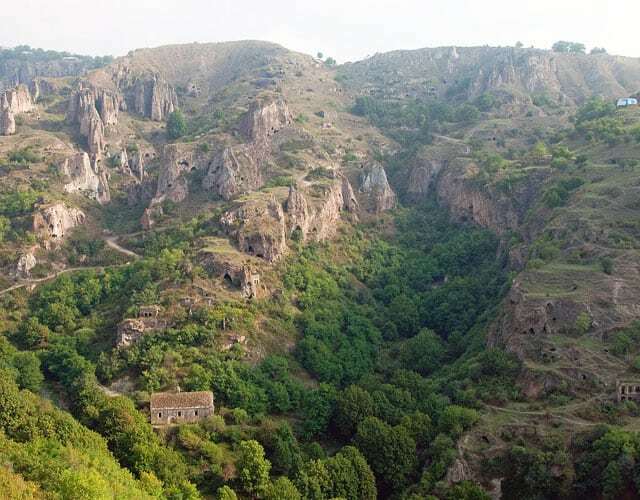 In the same region of Syunik, there is another attraction that’s popular among tourists: the old village of Khndzoresk. This is a unique settlement where time seems to stand still. The old part of the village is composed of huge caves where people lived until the 1950’s. A new bridge connects the two parts of the village and the views from the bridge are quite literally breathtaking. 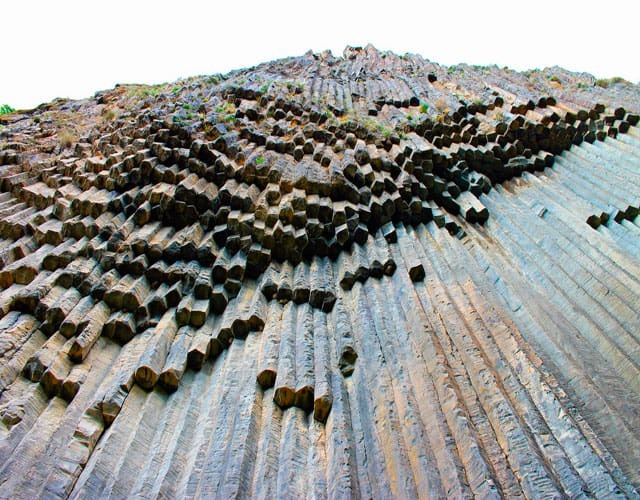 In the Kotayk region of Armenia, there is a beautiful canyon called Garni that’s famous for its unique basalt columns. As a result of geological processes, the stunning natural symmetrical columns were formed and these days, they’re aptly called ‘the symphony of stones’. Indeed, if you look at the canyon from afar, many of the cliffs resemble a giant organ! In addition to these popular sights, there are lots of less-discovered ones that are really worth visiting. Among them are the enchanting waterfalls ‘Mamrot Qar’ or ‘Zontikner’ (umbrellas). 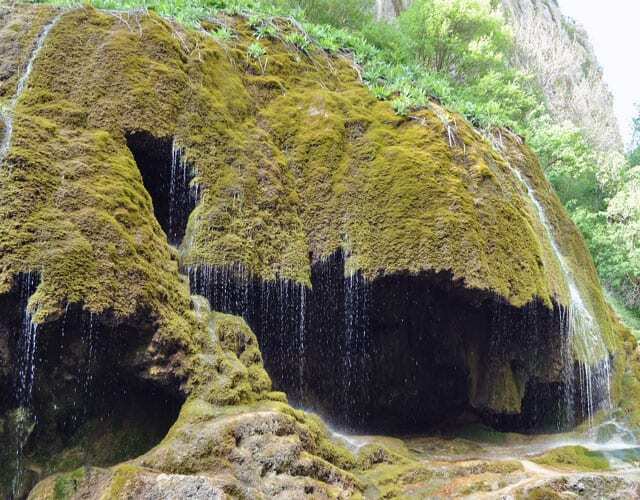 This interesting natural site is situated in Nagorno-Karabakh – the region in the eastern part of Armenia. The deep-water source originates in the Jrduz canyon, forming ever-flowing waterfalls in the form of a huge umbrella, covered with moss. This impressive natural monument is a sight that shouldn’t be missed. Note: this post was brought to you in collaboration with Arara Tours. Armenia is so stunning! I really like your photos! I visited briefly a while ago but I can’t wait to come back and see more. 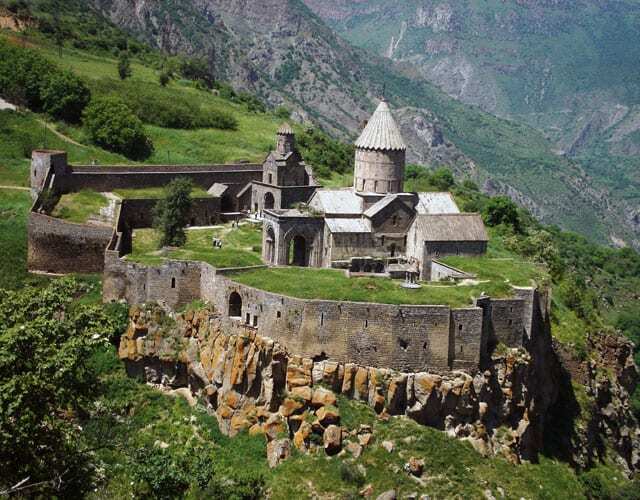 Especially the Tatev Monastery is high on my list, just gorgeous! What a beautiful country is Armenia. It is in my bucket list for 2017 and i have emotional connection to this place. My boyfriend has relatives escaped during the war and they all are so wonderful people that i can not wait to taste the local spirit! Thanks so much for your additional tips! [clicked too soon!] One final place, near Armavir, is the Metsamor Museum. Metsamor itself was a metal-working center thought to be from 3500 BC, but with an astrological platform now surprisingly dated to 5500 BC. The platform it self is at a weird angle, with lots of ancient carvings, 100 yards behind the Museum. The Metsamor Museum, though is worth the trip to this old village area. Outside among the lilacs are rows of fertility phalluses, some seven feet high. Behind the Museum are rows on ancient Cyclopean Walls, 2500 BC ones interesting with newer 1500 BC ones, and rows of fossilized mud rows that used to be houses. There are blocks stacked like cobblestones in cave-like underground structures, which are compressed animal bones (calcium) used to .purify metal when smelting by absorbing impurities; they were buried for a year underground to age enough to eliminate poisonous toxicity when fresh. On the 2nd floor of the museum, there are huge pots in rows on display, some glazed and some very primitive from 3000 BC, all recovered from the field in back or nearby. But in the cordoned off basement vault, the protected treasures of carvings and Babylonian trade objects of gold and jewelry are kept in lit displays. As you go down the steps, there are skeletons still in the ground. This vault and its contents is not on usual display You make a donation of 10,000 dram/person (about $2.30) to have guide take you down and turn lights on! The museum is not supported by the state — they raise all funds for leaking roof repairs and $7 a week salaries from visitors — so be generous! Selim Pass – Selim Caravanserai, 1370 AD, is just before topping out on the Selim Road. Well-preserved, and from the road above it, looking south, there is a great photo opportunity, with the caravanserai just below, the 22 switchbacks beyond, and a long series of peaks going off to the south. 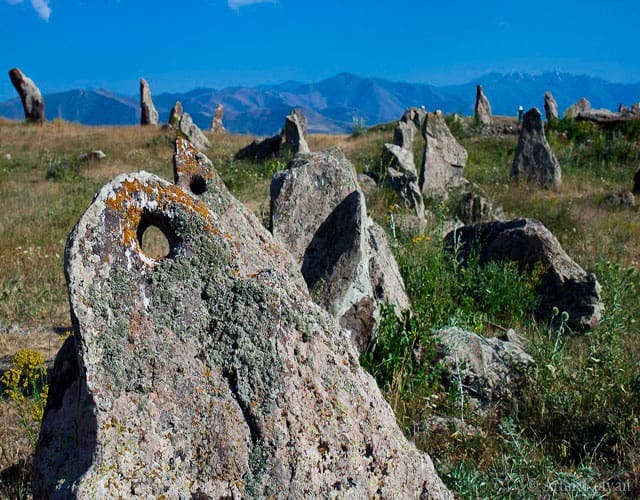 Karahunj – If you wander around on this treeless site, there are also over a hundred neolithic tombs, and total of thirty stone circles. The usual dates I have seen are 3500 BC, 1700 BC for the newest tomb. There are more tombs on SE side of Sissian (county capital), also dated 2000-1500 BC. Khndzoresk – I have been on this road four time from 2005 to 2013, and the cave village i see each time Is on the LEFT side of the road, going eastbound, the village of Tsegh, last town before the border with Artsakh (Nagorno Karabagh). I wish there were more details about where on that forty mile stretch of road that and on the RIGHT side Khndzoresk is located; much of that road falls away on the right side going east, but look forward to finding it. This is Areni Cave, with the oldest wine presses of human history, 500 years older than anything in Georgia. I plan on visiting Armenia next year so now I’m doing my research. It’s such a shame very few people get to see this country, I myself wouldn’t have booked a trip if not for a friend that was born here and managed to convince me. I’m curious to see their traditional clothing, from what I’ve found online it’s breathtaking! Thanks for the tips, I added all these on my list, let’s just hope I manage to see as many places as possible. The fact about Yerevan says 782 AD it should be 782 BC. very interesting article. Nice pics & Nice places.